One of the new live jazz options to emerge in Downtown Columbus in recent months is a fun weekly event at Blind Lady Tavern on East Mound Street. 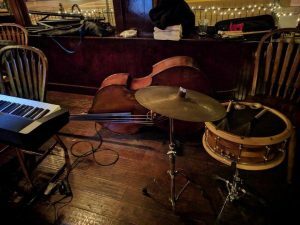 This restaurant and bar with a Southern flair hosts the John Householder Jazz Trio for two sets each Tuesday from 8 to 10:30pm resuming April 24th when the gig returns from a two week break while Householder visited family. Better known as longtime New Orleans style pianist Chief Johnny Lonesome, Householder’s new piano trio also features two fellow Columbus mainstays: bassist Roger Hines and drummer Joe Nelson. Householder told me that now that he is retired, his “bucket list” goal is to memorize 100 jazz tunes, and these gigs are a chance to share the results in a laid back environment. When I caught their first set on April 3rd, I heard a charming variety of material, like a warm and friendly take on “Alone Together,” the big city shuffle of “Take The A Train,” and a cool, bluesy run through Stanley Turrentine’s “Sugar.” The bar is an enjoyably relaxed venue for jazz, with an excellent Southern menu – the chicken and waffles and hush puppies were both delicious – and a cocktail list with a whiskey focus. When I attended, the trio’s performance was videotaped, so stay tuned to Householder’s website for footage. Check out a swinging new weekly gig and enjoy friendly live jazz in a festive setting – No cover!